The Fearless Presentations® public speaking course is offered in Chicago, Detroit and other Midwest cities like St Louis, MO. 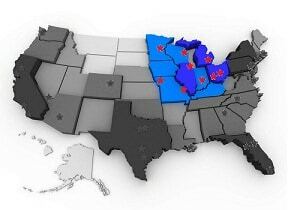 Open enrollment classes for individuals and small groups are taught in major cities throughout the Midwest region. (A complete list is below.) We also offer private custom workshops and presentation coaching in any city within 500 miles of the cities listed below. We hold classes in Missouri in both St. Louis and Kansas City, Missouri. We also lead seminars in Minneapolis and St. Paul, Minnesota near Minneapolis-St. Paul International Airport. Chicago, Illinois is one of our most popular locations, and we hold courses near the Chicago Magnificent Mile. In Wisconsin, our programs are held in Milwaukee, Wisconsin. In Indianapolis, Indiana, we hold the class in downtown Indianapolis every few months. We also teach presentation skills training in the Detroit suburbs near Detroit, Michigan. We conduct quite a few classes in Ohio cities like Cincinnati and Columbus. The Cincinnati class is held in the downtown area, and the Columbus location is near the airport.